Best of all, Amrit can strengthen the body’s resistance to the harmful effects of free radicals. And free radical damage is linked to over 80% of disease. Antioxidants are powerful compounds that help neutralize and prevent the damage caused by free radicals in the body. Amrit Kalash is a full-spectrum antioxidant, which means that its complex formula contains both water-soluble and lipid-soluble herbal ingredients, allowing its antioxidant power to reach all parts of the cell. Research shows that Amrit helps maintain healthy functioning of the heart and cardiovascular system by decreasing free radical damage to LDL cholesterol and keeping the arteries clear. Amrit also significantly reduces free radical damage in the brain, combating stress and nourishing the mind’s natural capabilities. Research has shown that Amrit can even help diminish the toxic side-effects of chemotherapy. Amrit is a two-part formula that provides balanced support for both mind and body. 1. 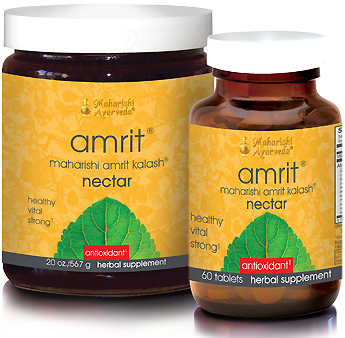 Amrit Ambrosia is an all-natural blend of 13 traditional herbs that are especially good for the mind, brain and nerves. Published scientific research shows that Ambrosia is up to 1000 times more effective than Vitamin C or Vitamin E in its antioxidant power. 2. Amrit Nectar combines 42 potent wild-crafted herbs that operate on the cellular level to neutralize existing free radicals and protect against future free radical formation. Since Ambrosia and Nectar work together synergistically, I recommend that you take both formulas daily. *These statements have not been evaluated by the Food and Drug Administration. MAPI products are not intended to diagnose, treat, cure or prevent any disease. If you have a medical condition, consult your physician.